Cuisinart’s Multiclad Pro cookware uses the same steel and aluminum triple-ply construction of All-Clad pans, but at $130 for a complete set, you can actually afford to buy them. 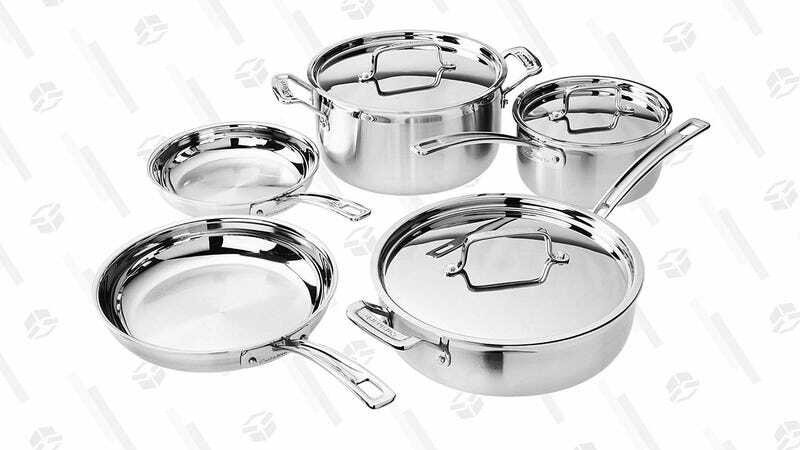 The durable and induction-friendly stainless steel exterior combines with an even-heating aluminum core that extends all the way up the sidewalls, giving you the advantage of both metals in a single pan. If you’ve ever cooked with tri-ply, you know that it really does make a difference. This collection includes a couple of skillets, a saute pan, a sauce pan, and a stock pot, which together should meet nearly all of your cooking challenges. If you’re still using the $10 pans you bought when you moved into your first apartment, these are going to blow you away. Just note that this is a Gold Box Deal, meaning it’s only available today. Why Wouldn&apos;t You Buy the Complete Cowboy Bebop Series For $10?